Dies R Us: Silent Night! Well, I'm guessing you have been checking this blog each day for some great last minute ideas for your cards, haven't you? At this point in time, I think we are all looking for ideas that we can use to put a card together that is not only quick, but more importantly, GORGEOUS! I think this card may be just the thing you need. It can be done quickly with just 3 dies and looks like something you spent hours & hours working on! The three dies I used were: Impression Obsession Fir Trees, Impression Obsession Small Snowflakes, and Impression Obsession Small Deer. To create this beautiful scene, I cut my green background 1/4 inch smaller than my card. I then cut another piece of my white cardstock 1/4 inch smaller than the green mat & cut 2 of the largest trees from the Impression Obsession Fir Tree set directly into the center of it. After gluing the white cardstock with the 2 trees cut from it directly onto my green, I then glued the 2 white trees that were created with my original cut directly onto the card overlapping the green trees. All I had left was to add the deer and the beautiful snowflake. Both the snowflake & white trees were coated with Wink of Stella for more shine & sparkle! Here is a closeup of the snowflake. There are five snowflakes of varying sizes in the set & I used the largest 3 & layered them for this beautiful snowflake. I hope I have given you some new ideas! Be sure to check out the Dies R Us Challenge Blog too! There is still time to enter the current challenge & win a great gift voucher you can use at the store! Until next week, happy crafting everyone! This is a gorgeous card, and I was so happy to read your description that it makes a quick, last minute card. I really don't mean to sound crabby, but am I the only person who is getting frustrated by the fact that every die you have featured today is "out of stock"? Yesterday's card was the same story. Perhaps you are designing these cards for the sake of customers that already own the featured dies. I would like to become a customer of Dies R Us, but when I see the "out of stock", I just go on to the next store to find what I want. I know this is not your intention, but I just wanted to let you know what is happening. Take care. Linda, I'm sorry these are out of stock! I know how you feel as I run across this at times too & I always add my name to the waiting list because they are never out of stock for very long & they will notify you the minute they come back in! This close to Christmas, it is REALLY hard to keep everything in stock, but they do a pretty terrific job getting it back in quickly! Don't give up!! 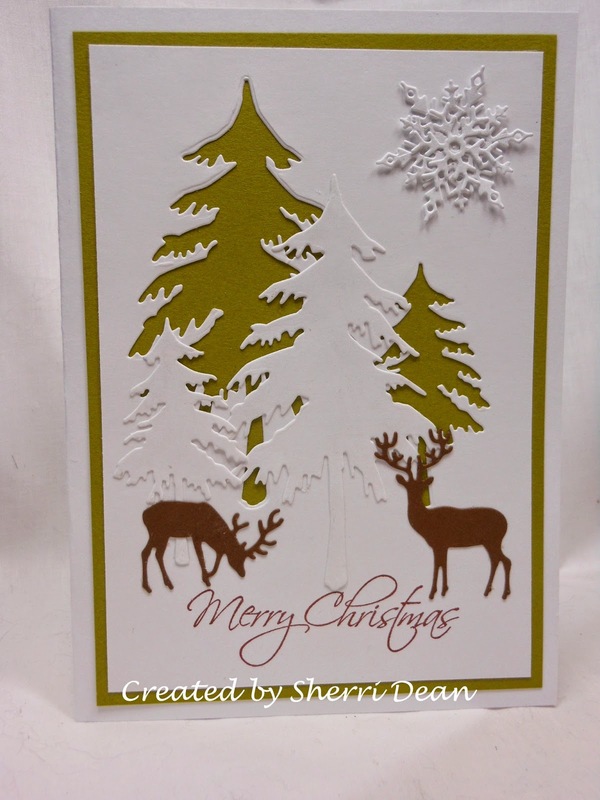 I love the classic look of the snowy fir trees and also love the reindeers! Great card! Ringing out the old . . .
Last Minute Fast & Easy!! Merry Christmas Time is Here! Time to Decorate the Tree . . . Dies R Us Facebook 1000 Likes Event Winners!